Nearly everything in your home can now be linked through Wi-Fi, allowing you to control functions like temperature, music, and security systems all through an app. While this type of freedom and flexibility can make your home more convenient and efficient, it’s easy to feel overwhelmed with the number of smart devices on the market. Thankfully, it’s a whole lot easier than it seems—and you can often hook these systems up yourself. Here are seven DIY ways to make your home smarter. A smart television is an easy point of entry into the world of smart devices, and the set-up only takes a few minutes. These TVs will connect to your Wi-Fi, allowing you to download apps and streaming services right to your set. This capability all but eliminates the need to buy expensive accessories for streaming content, since the operating system is built right into the TV itself. All you’ll really need to do is punch in your Wi-Fi password and download some apps and you’ll be good to go. 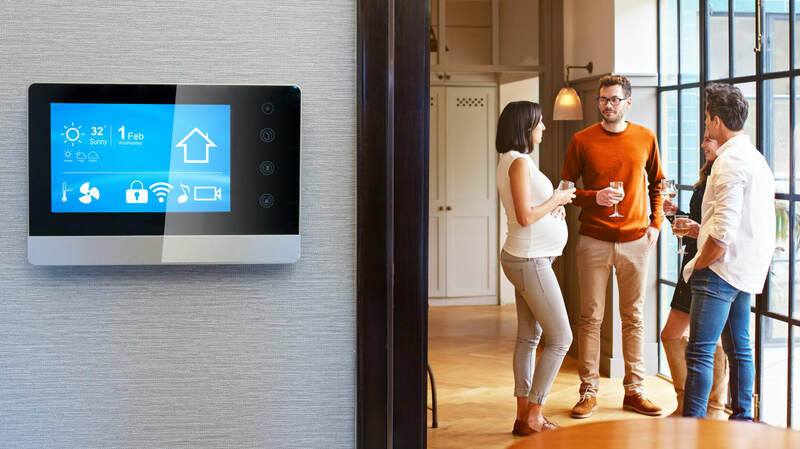 There are countless smart thermostats on the market today, and for good reason: It’s one of the best investments you can make in your burgeoning smart home. The best ones allow you to adjust your home’s temperature remotely, meaning you can turn your heat on right before you leave the office so your home is warmed up when you step through the door. Since your thermostat will be linked to your smartphone, you can check and adjust energy consumption and temperature in real-time, no matter where you are. This can save you money in the long run since you’ll be able to turn off air conditioners you mistakenly left on or dial back the heat if you’re not home. And the more recent models will even learn your schedule and automatically adjust the temperature without you needing to lift a finger. In terms of installation, these thermostats are often a great fit for someone looking to get into more DIY projects. Many manufacturers even put out their own video tutorials to help with the installation. First, though, do some research on your current thermostat to make sure the smart one you’re purchasing is compatible with your home’s wiring, furnace, and air conditioning units. 3. SMOKE AND CARBON MONOXIDE DETECTORS. Smart smoke/carbon monoxide detectors improve upon the standard detectors by sending clear warnings both from the device itself and to the smartphones of your family members or roommates. Additionally, many will go so far as to alert you about the specific room the smoke or carbon monoxide was detected in. One of the biggest issues with a standard smoke detector is that there is very little difference between the sound of its alarm and the sound it makes when you have to change the batteries. This leads to confusion that smart detectors avoid, since many feature app alerts and voice alarms that say “Smoke detected” or “Low battery” rather than the traditional chirping. A smart smoke detector is one of the purchases you can make on your way to having a full-fledged smart home. They’re fairly inexpensive, and if you can install a standard detector, you can install a smart one. Smart light bulbs are easy to install, come with a range of features, and can save you money by turning on only if there is somebody in the room. On top of that, the best ones on the market change colors and can be controlled anywhere from your smartphone or through your desired smart hub. In terms of installation, there are a few accessories—including a hub that connects to your Wi-Fi—but they’re simple to hook up. Like the smart smoke detector, a smart bulb is an easy step towards a smart home or a perfect gift for someone who might be intimidated by installing something as complex as a thermostat. When it comes to smart security devices, there’s a whole world to choose from. There are video surveillance devices, smart locks, doorbells that include motion sensors and built-in cameras, outdoor motion lights, and smart home security kits, complete with a subscription to a private service. Larger systems can require professional installation, but if you just want to set up an indoor camera or two, there’s no reason you can’t take a DIY approach. Again, like most other devices on this list, the biggest things you’ll need for installation are your Wi-Fi password, the camera’s app, and probably a few tools to place the camera wherever you want it. Most companies will have step-by-step video instructions on their websites to make the process even easier. Once you’ve got your camera installed, you’ll have the ability to view a live feed from your phone wherever you are. In some cases, you don’t need smart devices, just a smart outlet. These outlets plug into your normal electrical outlets, which you can then plug appliances like standard fans and lights into. Once the smart outlet is connected to your Wi-Fi, you control the outlets through an app that allows you to turn the power on and off from wherever you are and schedule the devices to go on at specific times. That means you don’t need to ditch your favorite lamp in order to control it remotely. And depending on the make and model of your other devices, these outlets can interact with other appliances in your house or be run through your smart hub, allowing it to be commanded through your voice. Many companies are producing smart outlets, so as with everything on this list, do your research. See which outlets are compatible with your existing devices and whether a smart outlet works best for your home. The finishing touch for a truly connected smart home is the smart hub. This is a device that can, ideally, control most—if not all—of your smart devices, such as lights, thermostats, and televisions. Instead of having a dozen different apps for all your separate smart devices, you will be able to run them all through this main hub, either through its own dedicated smartphone app or voice commands. Before selecting a smart hub, do your research and choose the one that works with your other devices and any pre-existing services (such as a streaming music account) you may have. Your choice of hub could lock you in to many other smart device choices, so stick with one from a company you already trust. Thankfully, these hubs are relatively easy to install, fairly inexpensive, and have a range of interesting features. All you’ll need is your Wi-Fi information and a place to put it. Be sure to subscribe to any email updates about the device, as tech companies are constantly enhancing their capabilities. With everything running through your hub, controlling your smarter, more efficient home will be a breeze. Automating and simplifying processes around your home is smart. Automatically getting more cash back is even smarter, and Discover’s Cashback Match is a smart way to earn extra cash back. Discover Card automatically matches the cash back you earn, dollar for dollar, at the end of your first year. Visit Discover to learn more.